June | 2013 | Portland! Warning: I am not a mechanical engineer or a contractor, and this is not an intended use for shelf brackets or hose clamps. But it’s very solid, I have no complaints and I’d do it again. The reason it works: the brackets are “heavy duty” and have a welded brace, and those special hose clamps are also very strong. My choice for this was a 1″ barbell. You get chrome, knurling, and it’s bulletproof. They’re on amazon for just over $30, shipped to your door, or you can find one on craigslist for less than that. Or used at play-it-again sports. Or your uncle probably has one that he never uses. They grow on trees. Downside: they’re longer than they need to be because of the portion used for plates. If your installation is width-constrained then maybe you can you can lop off the threaded parts you won’t hang from anyway (say, with a cutoff wheel in a grinder) or get a 1″ pipe at a hardware store and wrap it with grip tape. 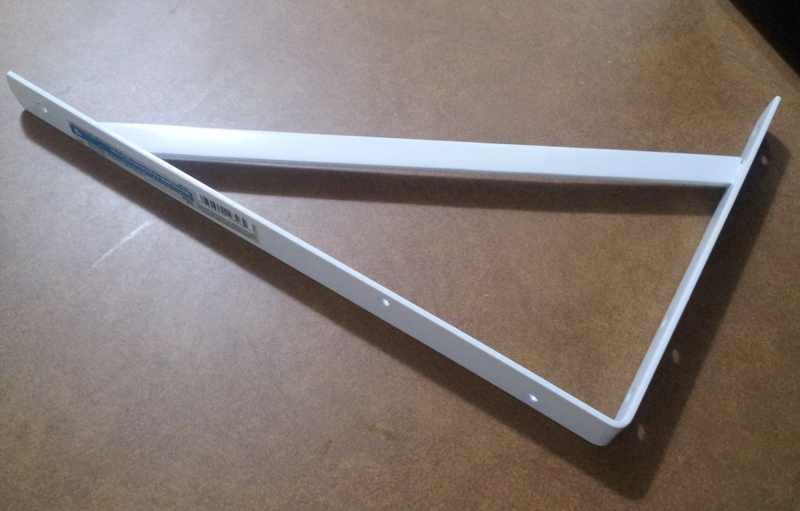 Home depot sells these great “heavy duty” shelf brackets that have a welded brace. They quote a 600lb working load limit when used as shelving supports (mounted on a wall, loaded from the side). When using two brackets (1200lb) for a 200lb user you have maybe a 6x safety factor for this part of the system. 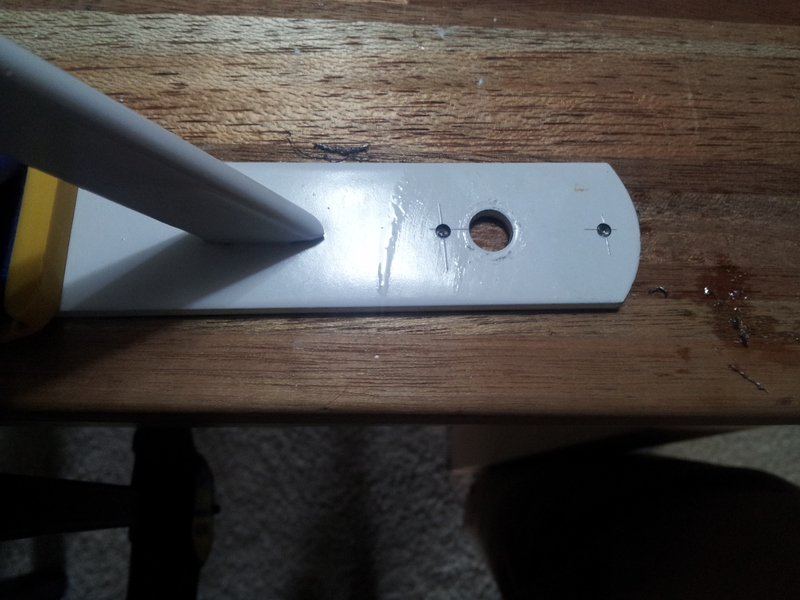 I would not use anything weaker, like a stamped bracket that isn’t welded (ordinary shelf brackets). They come in a range of sizes; I picked 16″ x 10″, with the 16″ side against the ceiling. 10″ is enough clearance for my chin to get over the bar and not bump my head on the ceiling, but maybe if you do fast pullups and overshoot you’ll want a larger size. It has three holes on each side for screws. You want a 1″ model to fit a 1″ bar- there is no nominal sizing to worry about with these (usually). Should cost ~$5 each, plus shipping. You need 2. These are probably the weakest part of this system, so don’t go cheap on screws. I used Spax 2″ wood-to-wood exterior screws with a pulling load rating of 870lb per screw (the box recommends a 4x safety factor; there are four screws bearing most of the weight; so maybe I could load ~900lb? I dunno). Lag screws would be a good choice. Make sure they fit the holes in your brackets, but if they don’t I guess you could enlarge them. 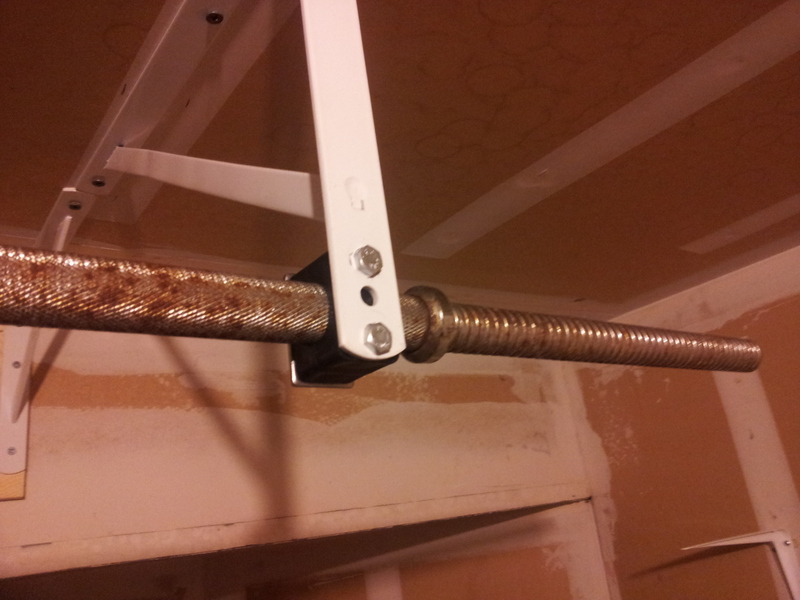 $72 worst case: $32 for a brand-new barbell; ~$40 for the rest. Significantly less with a used bar, or a generic 1″ pipe of some sort. 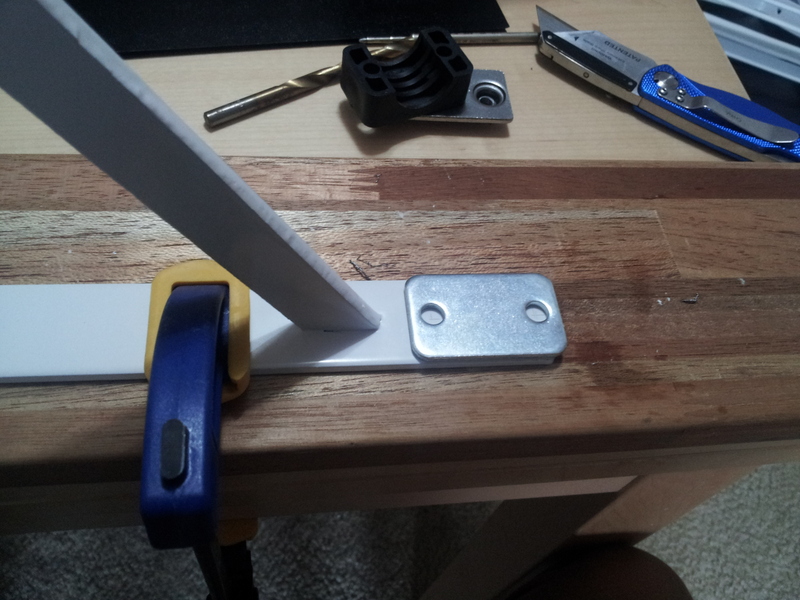 If you have the screws lying around and your uncle gives you a bar, it’ll cost you two brackets and two clamps ($28). Not bad! -drill bits for the steel brackets. Nothing special, HSS is fine. The set above is a cheap TiN-coated variety from Harbor Freight. The same bits can do pilot holes for joist screws. Wear eye protection for this part, if nothing else. Drilling metal can break bits with more energy and frequency than softer materials and send them flying pretty fast. 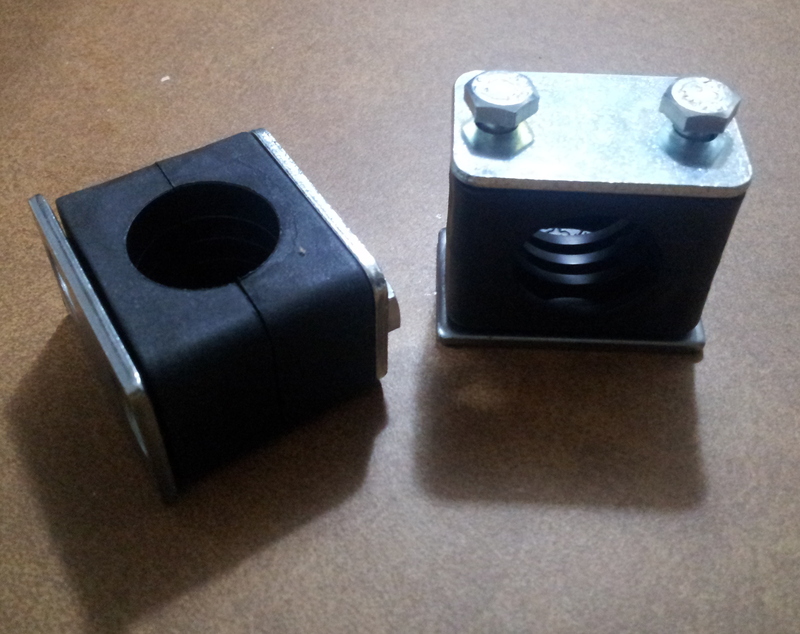 These hose clamps have a backing plate that you can remove and replace with the sheet metal of the bracket. Locate the centers using the backing plate and use a punch if you have one. Be as accurate as possible, especially with a hand drill. If the holes are not the right distance apart then the screws might bind and you’ll have to widen the holes to make it work. Drill a pilot hole. If you have a weak hand drill, then you can work your way up in sizes from the pilot hole to your final size. The bolts on my hose clamps were 1/4-20, and I made holes just a little bigger. Use a cutting fluid and clear the chips out frequently. 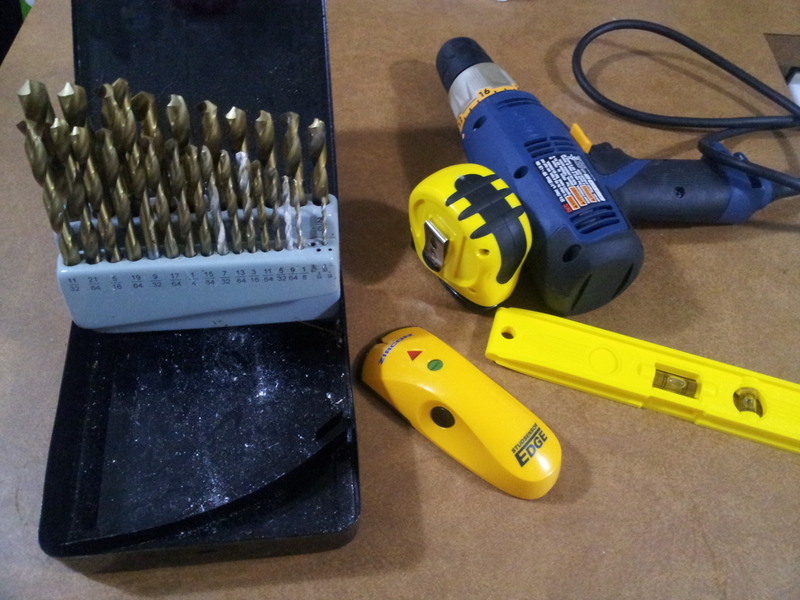 Don’t let the drill bit get too hot as it can weaken and wear out prematurely that way. It helps to clamp the bracket to a sacrificial piece of wood. This is probably the most important part! Use a stud finder and take some notes. Read a little about it if you haven’t done it before. Messing this up will weaken your installation, maybe to the point of it failing. 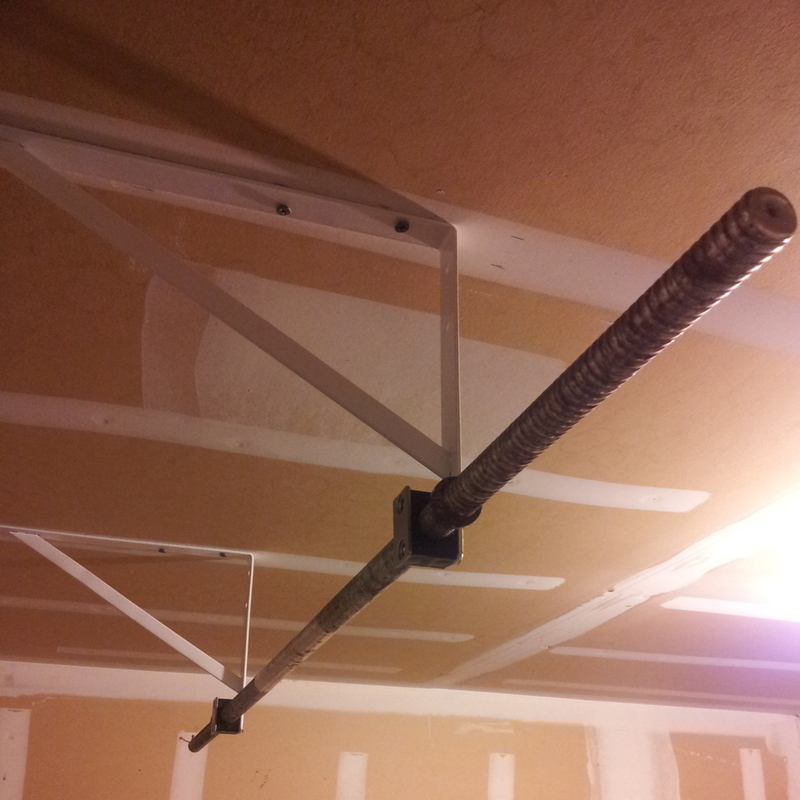 My joists were 16″ apart (very common) and I used two spaced at 32″, which neatly encompassed the grippy part of the barbell. You can see my garage is unfinished and the sheetrock nails are visible, but I didn’t use these as anything more than a rough guide- it’s best to find the true center. 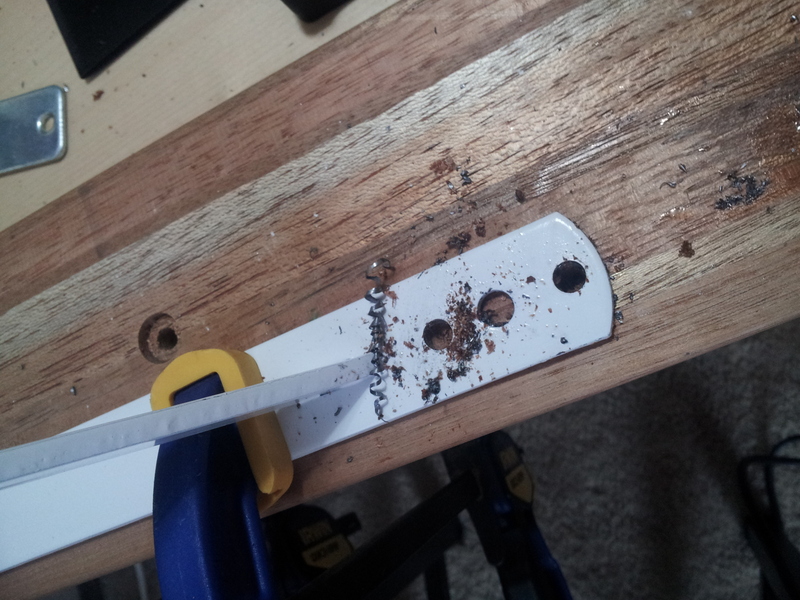 You will probably want to drill pilot holes for your screws. Usually these are just smaller than the core part of the thread, but maybe your box of screws recommends an exact size. My box said they weren’t necessary. It can be pretty hard to get a drill on the screws because the strut gets in the way. A really long extension is a great help if you have one. I used a hand screwdriver for a couple of them. Adding a wood backing to the bracket would reduce its ability to flex a little. An 8′ 2×2 (1.5″x1.5″ actual) at Home Depot would be perfect for this. It’s about $2 and they’ll cut it to size for you. You’ll probably need to replace the bolts with something longer in order to go through both the wood and the bracket. Adding a second set of brackets facing the other direction would just about double the strength and lower flexing too (I suspect if this was done the weakest part would become the hose clamps). Using a larger size bracket and mounting the hose clamps above the strut would make this stronger; with a cutoff wheel you could then remove the unnecessary part below the strut. Anyway, I think this version is just fine for me (185lb). With a little care and a piece of backing wood on the horizontal part this could probably be wall-mounted. If you prefer a larger thickness bar, use that. Hose clamps are available every 1/4″ from most manufacturers so it’s easy to scale this up. Here I have mounted a Metolious hangbgoard (the “Simulator 3D”) in the same style, using a backing piece. It isn’t drilled into the wall behind it at all, because that is actually just a sheetrock covering for a duct with no studs present. It sits flush to the duct and as a result has zero flex- but I’m pretty sure it wouldn’t budge if it was just ceiling mounted, like the pullup bar above. 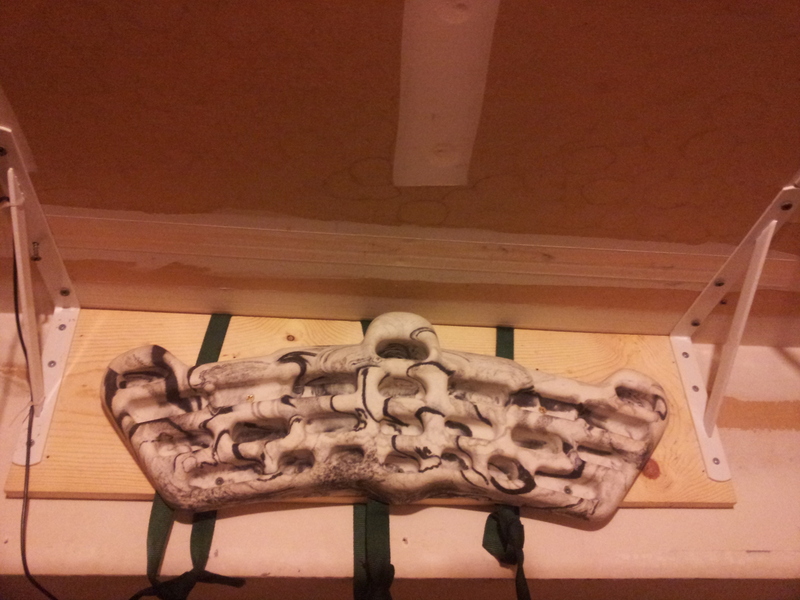 Note that it’s mounted close enough to the ceiling that it really is just a hangboard; I can’t do full pullups on it. The webbing straps are for use with ab straps or an assist band. 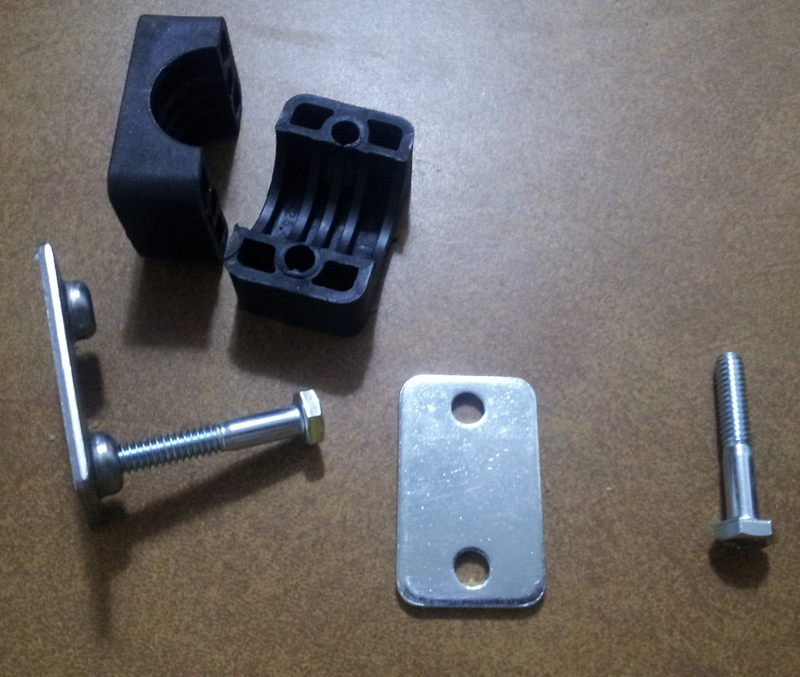 These brackets are a smaller variety (8×12″) also sold by Home Depot. This entry was posted in Uncategorized on 27 June 2013 by a wild z0r.